Englund Gambit Qe7 and Nge7 lines - Chess Gambits- Harking back to the 19th century! Instead of aiming to blast the centre open straightaway following 1.d4 e5 2.dxe5, Black can play to round up the e5-pawn with 2...Nc6 intending 3.Nf3 Qe7 or 3...Nge7. Both offer Black practical chances and have the merit of leading to highly unusual positions in many variations, but 3...Qe7 has a serious theoretical flaw and 3...Nge7, though probably Black's objectively best bet following 1.d4 e5, should concede a larger-than-normal advantage for White out of the opening. Black violates traditional opening principles by developing the queen early and threatening to cause disruption in White's queenside with ...Qb4+. However, Black's queen proves to have nuisance value in many variations and as Stefan Bucker has noted, "blowing Black off the board isn't easy". White often reacts with tame replies such as 4.g3 or 4.e3, and comes out of the opening with little or no advantage. However, White can get a larger-than-normal advantage out of the opening with 4.Nc3 Nxe5 5.e4, transposing into a dodgy line of the Nimzowitsch Defence for Black, 1.e4 Nc6 2.d4 e5 3.dxe5 Nxe5 4.Nf3 Qe7 (more reliable are 4...Bb4+ and 4...Qf6) 5.Nc3. Black's game is playable, but quite difficult. White can hold onto the extra pawn with 4.Qd5, but this allows Black to get some compensation because it leaves White's queen exposed. 4...f6 has become established as Black's most reliable reply, aiming to open lines and gain time on White's queen immediately. Following 5.exf6 Nxf6 6.Qb3, Black usually strikes out in the centre with 6...d5 (the fianchetto with 6...b6 is too slow) and then 7.Nc3 is dubious as it leaves White's queen short of squares, so White should thus play 7.Bf4 or 7.Bg5 instead, envisaging rapid queenside castling, whereupon Black has some, but not full, compensation for the pawn due to the slightly better development and central control. Most critical, however, is 4.Bf4, challenging Black to create disruption in the white queenside with 4...Bb4+ 5.Bd2 Qxb2. White must avoid the trap 6.Bc3?? Bb4 7.Qd2 Bxc3 8.Qxc3 Qc1#, and should instead play 6.Nc3. Then the old main line 6...Bb4 7.Rb1 Qa3 8.Rb3 is fully playable for Black, but the strong 8.Nd5 is close to a theoretical refutation. White attacks c7, and can force Black to play ...Kd8 in order to defend that square, thus giving up castling rights and leaving White with excellent attacking chances. Black can try to duck out of this line with 4...d6 5.exd6 Qf6, or 5...Qe7 6.Bc3 f6, but neither of these deviations give Black much compensation for a pawn. This is generally known as the Zilbermints Gambit, as Lev Zilbermints has analysed the line extensively and established many of the key ideas. In many cases Black's idea is simply to play ...Ng6 and win the pawn back, and if White just develops quietly then White typically gets a small edge but Black can get counterplay. 4.Bf4 is one of the two most critical responses. Then some very complicated lines arise after 4...Ng6 5.Bg3 Qe7 6.Nc3 Qb4, but White should be able to get the upper hand. 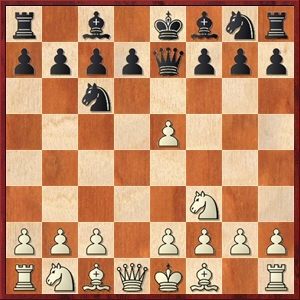 7.Qd2 is probably the most critical response, inviting Black to take on b2. Instead White can play 5.e3, whereupon Black can get partial compensation for a pawn starting with 5...d6, with a typical continuation running 6.Bb5 Bd7 7.Bg5 Qc8 8.exd6 Bxd6. 4.Nc3 is perhaps the biggest problem for the 3...Nge7 line, as White develops with purpose. One key idea is that 4...Ng6 is ineffective because of the continuation 5.Bg5 Be7 6.Bxe7 Qxe7 7.Nd5. Black can thus try 4...h6 instead, with ideas of ...Ng6xe5 and also ...g5 and ...Bg7, and Black's game is playable but White can accumulate a significant lead in development while Black spends time regaining the e5-pawn, giving White a greater-than-normal advantage out of the opening.